No I’m not talking about “special” brownies. I’m actually talking about mushrooms. Yes, just like the ones the Super Mario Brothers were wise enough to eat and power up. You can learn so much from video games if you just pay attention. 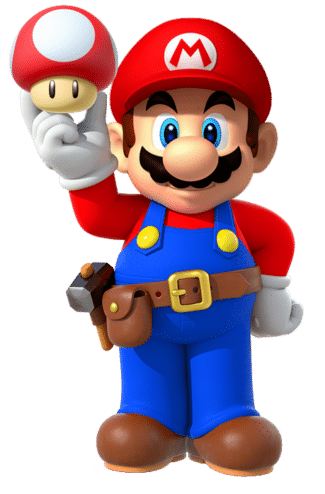 Important tip, those mushrooms they were eating aren’t actually safe for humans just computer generated video game characters so don’t eat them. 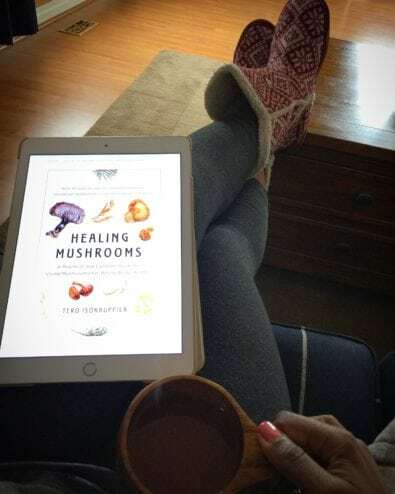 Recently, I have been consuming all types of mushrooms for their various health benefits. As such, I have also been obsessively and ravenously consuming all the knowledge I can find on the subject. From books, to Facebook groups, TED Talks, all the way to online classes. My brain is literally filled with “shrooms”, minus the magic kind of course. Good thing I take Lion’s Mane or I may have not had the ability to consume and retain this much information. * This is a great book written by the founder of Four Sigmatic. Great introductory and technical information, plus a ton of very interesting recipes using mushrooms. Available via Kindle on Amazon, hard copies sold on the company site and Amazon. All things considered, I still have a lot more to learn. What I can say is that my life has been for the better ever since I started using them daily. I have been on mushrooms long enough to be able to acknowledge its effects on my body. I endorse the use of mushrooms one hundred percent, at least for my family and myself. I suggest you learn a little about the varieties out there and test them out yourself and then you can decide. 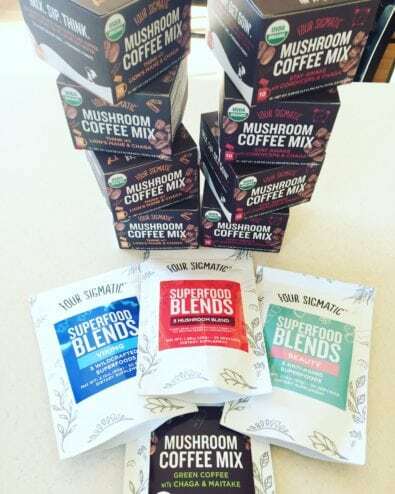 Meanwhile, one of my absolutely favorite companies that help make getting in your daily mushrooms so much easier is, Four Sigmatic. What they recently did literally blew my mind. Four words, Mushroom…Matcha…Drink…Mix. 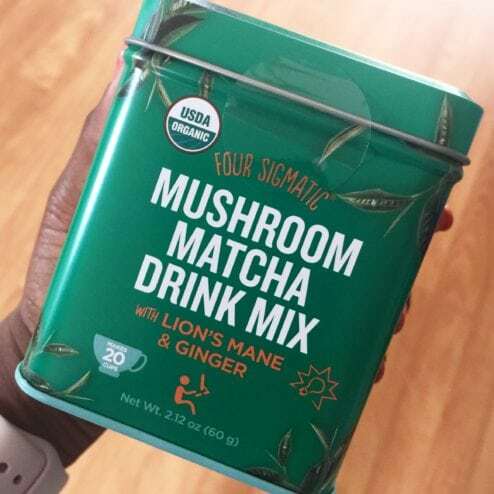 They officially found a way to pair two of my favorite things…matcha and mushrooms. What more can I ask for? In this case they used a Chinese Matcha and mixed with it medicinal mushrooms and ginger. Did I mention it is organic and vegan? Well, it is if you care about that sort of thing. I know I do. The mushroom in this blend is Lion’s Mane. 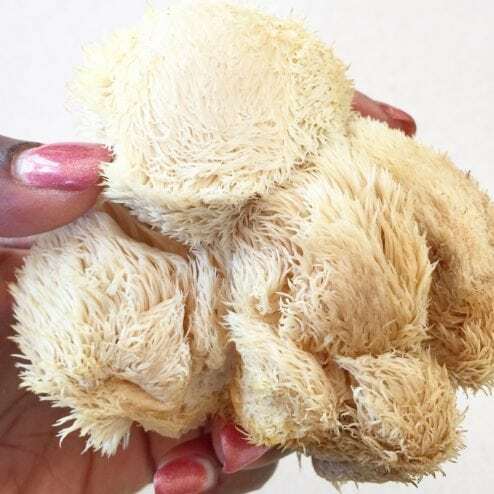 Lion’s Mane is amazing for brain support. You’ll find when I’m studying I’m usually sipping on this mix. Trust me I can use all the help I can get. 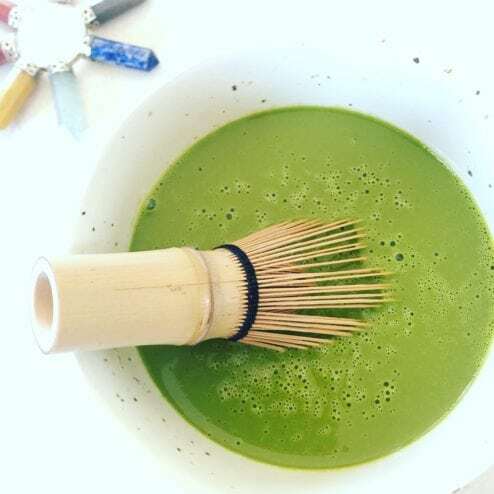 Plus not only does the matcha have a fresh, earthy, and vegetal flavor it is also packed with antioxidants. 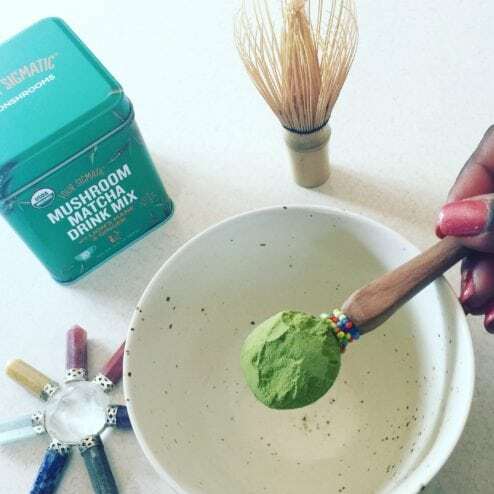 If you want to get into the technical stuff then look it up, you’ll find plenty of research explaining the benefits of mushrooms and matcha. Or if you’re like me and just want it to taste good and feel good about drinking it then I’d say go for it. 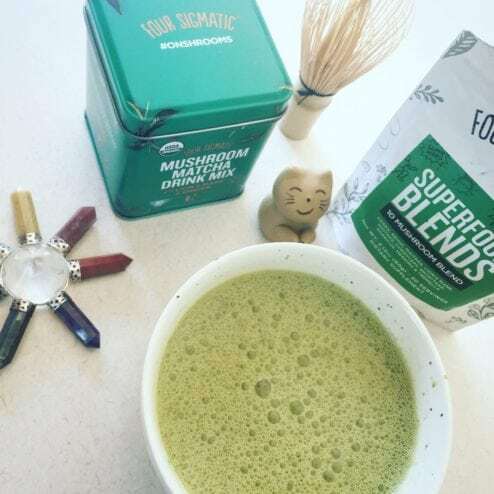 *Bulletproof Mushroom Matcha Latte made with unsalted grass fed butter and organic extra virgin coconut oil. *Fresh Lion’s Mane Mushrooms. Unique in flavor. I love it sautéed in butter with some fresh cracked black pepper and a sprinkle of Pink Himalayan Sea Salt. I will admit being the tea fanatic I am, I was disappointed to hear that the matcha was not from Japan. That could just be the tea snob in me. However, I didn’t want my snobbery to deter me so I still gave it a fair shake. I can tell you it has a wonderful flavor. It isn’t lacking in anyway so please don’t let that deter you from trying it out. Don’t take my word for it. Try it out yourself. Feel free to scroll through again and drool at all the pictures and then place an order. In case you want more suggestions, I am also a huge fan of their elixirs and Mushroom Coffees. Anything with Chaga is a must if you want to avoid getting sick and keep your immune system strong. You’ll want to try Cordyceps, if you’re an active person and want to perform more efficiently. Reishi for a little added peace and rest. Use the link I have provided here and you’ll get yourself 10% off your entire order. No excuses so make it happen. Like with anything else do your research, consult your doctor if you desire. I’m not a doctor.